wpDiscuz comment plugin settings are located in Dashboard > Comments > Settings admin page. The third tab is the “Comment List Settings” tab. Here you can manage all front-end action buttons, features and comment display options. If this option is enabled only parent comment will be displayed. This increases page load speed and keeps pages light. If a visitor wants to read replies he/she just need to click on [view replies (2)] button located on all parent comments with at least one reply. This option allows to hide/show comments sorting buttons. wpDiscuz comment list can be ordered by newest, oldest and most voted comments. The sorting buttons are located on the right side of the top grey bar (sometimes called as subscription bar). By default comments are sorted by newest comments (new comments on top). This is based on the according WordPress native discussions setting in Dashboard > Settings > Discussions admin page. Using the comment sorting buttons described with “Show sorting buttons” option above, you can sort comments by most voted value. And using this option you can set this order by default. 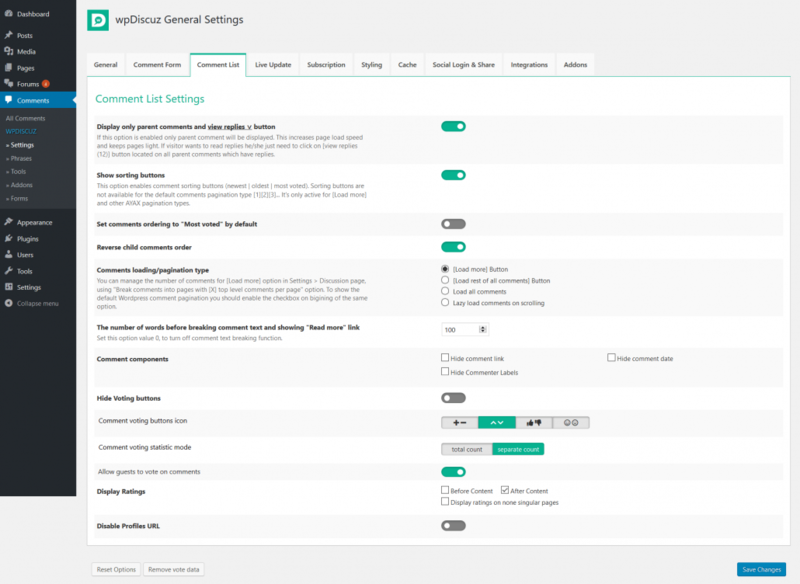 Because of there is no such an option in native WordPress comment sorting settings (Dashboard > Settings > Discussions), we added a separate option in this Tab. By default child comments are sorted by oldest on top. Using this option you can revers child comments order and sort them by newest on top. By default, at the bottom of comments list, wpDiscuz displays an AJAX powered [Load more] button. Clicking on this button initiates loading of next X number of comment threads. If you choose the [Load rest of all comments] type of pagination, it’ll load the rest of all comments. Though wpDiscuz is made super fast, we don’t recommend this pagination type if you have hundreds of comments per post. It doesn’t matter how fast and well codded is a comment solution, the large number of comments will always be loaded slower than a regular 10-20 comment threads with dozens of replies. The “Load all comments” type is also not recommended for such websites. It’s better to use the default [Load more] or the Lazy Load types. When the Lazy Load is enabled, only the first X number of comment thread are loaded with a post. It starts loading another X comment thread when you scroll down. The X number of comment threads per loading action is defined in WordPress discussion settings and used by [Load more] or the Lazy Load types. This settings are located in Dashboard > Settings > Discussions admin page. If you check the checkbox at the beginning of “Break comments into pages with…” option, the comment pagination will be changed to standard [ 1 ] [ 2 ] [ 3 ] type. These are the native pagination buttons of WordPress comment system. Note: wpDiscuz AJAX sorting buttons are not available when the default WordPress comment pagination () is enabled. However you can use “X top level comments per page and the [last/first] page displayed by default” option, allowing to set whether the page with oldest, or newest comments is to be displayed first. By default WordPress comes with “last page” and “oldest comments” options. Thus the newest comments are displayed with the last page on first page load. wpDiscuz has a solution for long comment texts. It breaks the text and adds read more>> button. It loads the while comment text once the button is clicked. This is an another good function to keep the comment loading process fast and light. Using this option you can set the number of words before breaking the comment text. As you see the closing </p> tag doesn’t exist, it’ll affect all HTML structure of your comment list. And this kind of problem will happen with all other HTML tags. The WordPress post excerpt works exactly like wpDiscuz comment excerpt, this is a standard text breaking logic. Using the “Hide Voting buttons” option you can disable it on comments. Using the “Comment voting buttons icon” option you can change the button icon to +/- , up/down arrows, like/dislike or to emoticons. The “Comment voting statistic mode” option, allows to change the default “total count” mode to “separate count”. wpDiscuz allows to create custom comment forms with custom fields. If you have a Rating Field in comment form the rating result will be displayed for each blog post and page. Also, you can use wpdrating shortcode in post content to display rating average and stars. More info in gVectors Support forum. By default wpDiscuz adds a link with comment author avatar to the author profile page, you can disable this link using this option. The author page link goes to the author page, provided by WordPress. This is an archive page with the author posts. More information in WordPress codex.